My love for breakfast might be why I’m tickled with this new eBook from Red and Honey – The Breakfast Revolution. 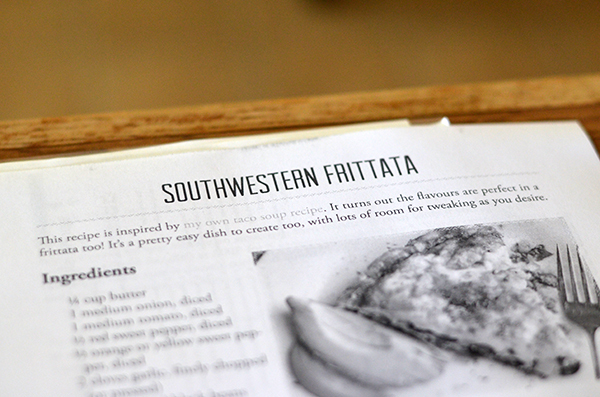 A cookbook dedicated totally to breakfast? Sign me up, buttercup! It’s full of yummy goodness that will make me hop right out of bed in the morning and get cooking…okay, so maybe not hop. Maybe limp out of bed – or roll out of bed. I need a coffee maker on my side of the bed. Or a fork lift. Speaking of forks lifting…. Listen to some of these beauties: Cinnamon Bun Muffins, Bacon-Wrapped Baked Eggs (goodness, you should buy the book for that recipe alone! BACON!!!! ), Maple Breakfast Custard, and Coconut Oil Frothy Coffee. I’m hungry. Is anyone else hungry now? It’s that darn bacon calling me again. 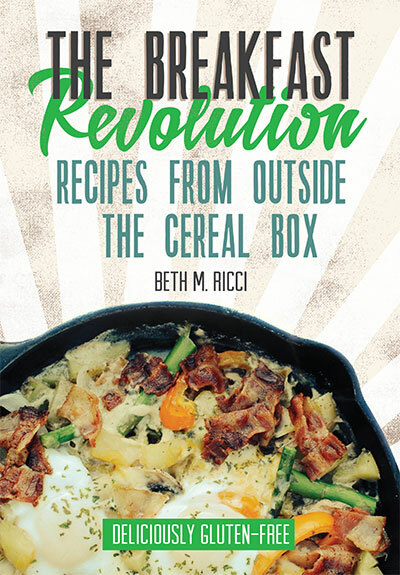 NOTE: I am not an affiliate with The Breakfast Revolution – I just want to promote it because I can. So take THAT, FTC. 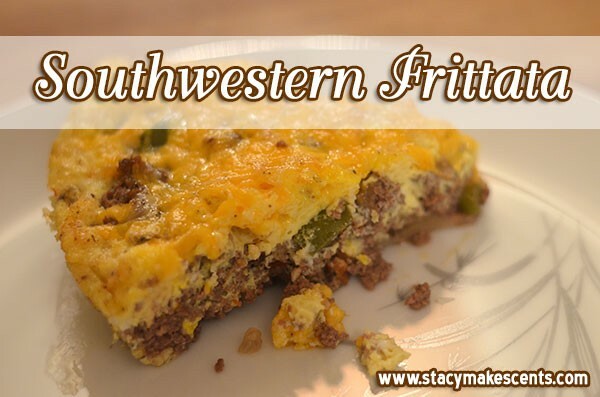 Beth graciously said I could share Southwestern Frittata with you all – one of the 40+ recipes you’ll find in her book. I was tickled with that choice considering I love southwestern food, and eggs, and meat, and well…since I just love food in general. I did a little tweaking, based on what I had. Because I have this disease that sometimes causes me not to follow recipes. Maybe that’s also the same disease that causes me to burn things in the oven. This recipe is super easy to throw together on a Saturday morning. I made sure my meat was already thawed, so I just got up and browned it and mixed the other stuff in it – voila! Breakfast is served. After you bake it, of course. Don’t eat raw eggs mixed with browned meat – unless you’re cool with that, then totally go ahead. Me –> not cool with that. You can also chop your veggies the night before if you’re feeling extra productive. In retrospect, I do wish I’d done one thing differently. I wish I had used sausage instead of hamburger – because I have this thing for sausage with eggs. Actually, I just have this thing for food. If you’re in a breakfast rut, you might want to give a look-see to The Breakfast Revolution – it’ll pull you out of your rut and set you on the right track…with bacon. Because the right track in life should always include bacon. I think I read that in the Constitution somewhere. See the new link up below the recipe for a bunch of GREAT sugar-free and grain-free recipes!!! Melt butter in an oven-safe frying pan. Saute onion, tomato, pepper, and garlic. 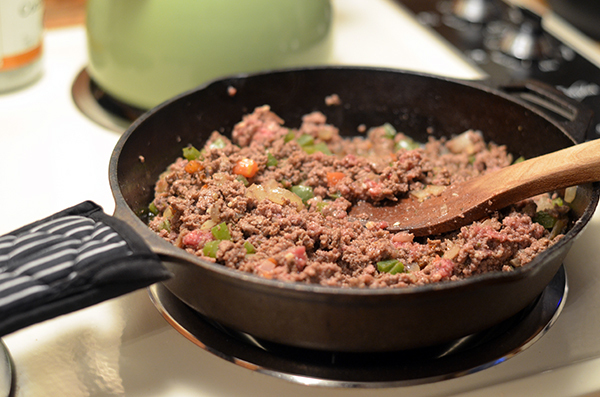 Add ground meat and cook until browned. Stir in spices. Whisk eggs, cream, salt, and pepper in a small bowl. Pour eggs evenly over meat mixture. Top with cheese and cook a couple minutes on the stovetop. Transfer OVEN SAFE SKILLET to oven and bake at 350 degrees for about 15 minutes or until set. Serve with sour cream and salsa. YUM. I totally know what you mean about Must Have Food-Now! 😀 Not always the same time as you, but definitely. FYI: I love your “I’m not an affiliate” comment! And I saw your link on Nourishing Simplicity’s Simple Meal Friday link-up. I’m not a breakfast eater, really. I eat it, but I’m not READY to eat until about 9:30. Any earlier than that and I feel sick. What a weirdo. 🙂 This looks yummy! We like to have breakfast for dinner about once a week. This would pass, for sure! Thanks for linking up to Let’s Get Real! I go to bed each night thinking about what I am going to have for breakfast. I am so with you on your breakfast obsession. Love the frittata. Thanks for bring it by foodie friday. I would have to try this sans the onion because my Hubby isn’t a fan… Thanks for sharing! Stacy, I am right there with you on the breakfast love–I could eat breakfast for every meal of the day and be super, super happy 🙂 This frittata looks right up my alley. Can’t wait to try it! I love that your mom loved the muffins! We do, too – and the recipe does include variations for all sorts of GF flours, including almond. 🙂 Pinned your frittata, yum-o! And that’s what I get for not reading far enough. Doh. This looks delicious! 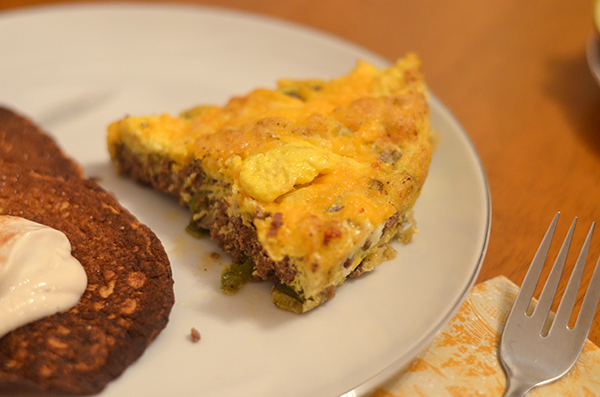 I like to make egg casseroles and frittatas for dinner. If I’m lucky, I get the leftovers for my breakfast. And I agree that sausage is the way to go! I LOVE my copy of The Breakfast Revolution. 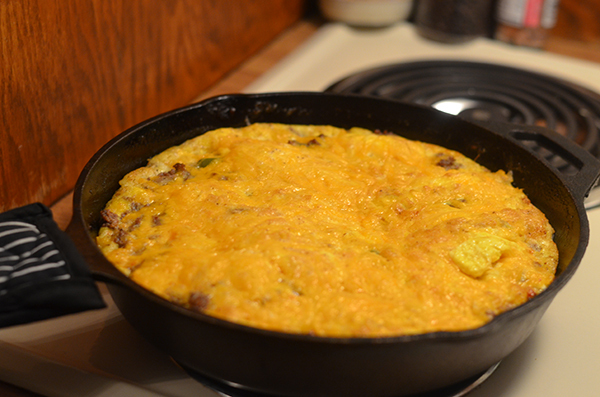 And I actually happen to be eating the Southwestern frittata as we speak LOL. We had it for breakfast yesterday and had one small slice leftover, and I just went and snatched it from the fridge before anyone else got to it 🙂 It’s SO yummy! Love the waffle idea! Hadn’t tried that yet.